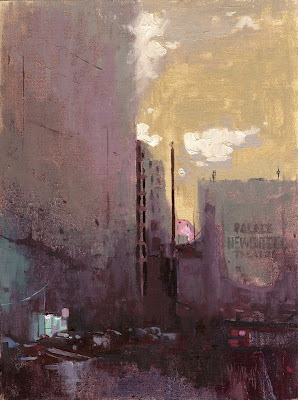 William Wray: Title? Which title? I haven’t pulled the camera back for a little while, so here is a long shot in Downtown L.A. This is a view of the parking lot behind the old Palace theater on Broadway at twilight. I’m sort of torn on a title... I like the vaguely enigmatic “Behind the Palace” or the generic “Lot Booth.” In my continuing quest to do less and get more, this one is mostly thin washes with rags and some limited brushwork to define the both cars and clouds. While I had reference on this, I edited, abstracted, made up colors and let the washes textures flow free as much as I could. William, I'm just about to start to paint with oils for the first time ever...and I admire your work more and more. This one beautiful. I am a firm believer that titles are over rated. I quite enjoy the colors of this piece. One of my favorites, love the color choices. Yellow sky, oh yeah dude! I'm loving these pinks you're pulling. Sweet image Bill. Hey Stef your are in for a world of wonder and frustration. Who is your teacher? "Lot Booth" has my vote. But then, titling my work has never been my strong point. The clouds are a nice touch, painterly and shapely against the buildings. Did you add them yourself, or were they there? HI William, I've just been browsing at your blog; really super paintings here, do you mind if I add you to my blogroll? I would like to pop in and see your work as you go along. Dirty and Beautiful! The advertising don't lie! The 'messiness' of your work is so appealing; how I wish I could loosen up like that. This is an amazing painting! I love the industrial feeling of this cityscape. Your technique looks effortless. Fantastic! Love the looseness and the colors you used. I prefer "Behind the Palace" myself, as it gives more info about the flipside of this coin. This is my favorite of your paintings, though the medium is oil it has a great modern California watercolorist/ impressionist feel to it. Well, whatever you want to call it, it's fantastic...colors and textures are unexpected and beautiful. Hello william, I discovered your work through the painting of a windmill you did recently...wonderful work! I really like your work! It makes me feel like I'm walking in a dreamworld. I love this one. I saw the stuff in the sky as the ultimate romantic interpretation of smoke from the smokestack,a dirty beauty all right! thanks Joe , Don and Thor! Talents all! Thanks for turning me on to JH Matt!